Brighton Elliot Moyo, the Zimbabwean South Africa-based man who Prophet Alph Lukau controversially ‘resurrected’ from the dead back in February has reportedly died for real. 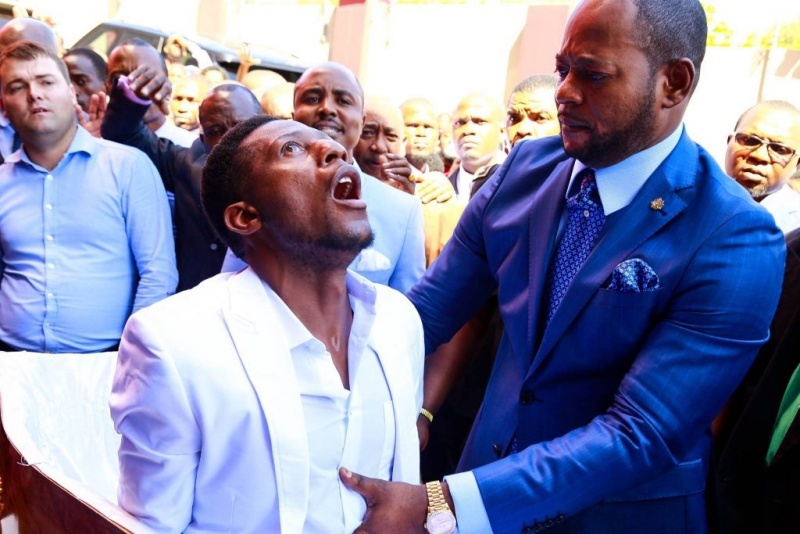 Elliot Moyo, the man who was magically resurrected in South Africa by Pastor Alph Lukau a few weeks ago has reportedly died ─and this time for real, there was no Pastor Lukau to resurrect him. According to H-Metro, a Zimbabwean Newspaper, Elliot Moyo died somewhere last week in a village called St Luke in South Africa. The report by H-Metro reveals that Elliot who was married with no child was buried on Saturday in the village called, St Luke in South Africa. “His stomach started swelling and didn’t stop for three days and on the third day, he died”, a family member disclosed to H-Metro. In February this year, Pastor Lukau was involved in a controversy when he trended online for bringing a “dead” man (Brighton) back to life and then later gave him food to eat. Their fake resurrection miracle also brought about the #ResurrectionChallengeon social media where some celebrities and social media users participated.